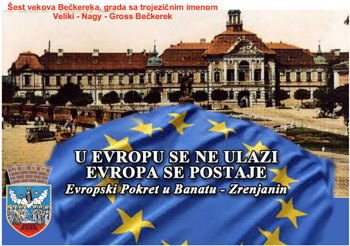 The greatest long-term project of the monograph Great Bečkerek and the region of Banat, there are also pieces about six centuries of the city from 1331/33 to World War II, until the city was named Big Bečkerek. Work is preprinted with the help of the Serbian Banat society - German friendship, the author of the monograph Master Schleich presented this capital a book that has more than a thousand pages, the book is written in the Serbian language in order to present the citizens of this old town met with its historical roots and numerous immigration from all sides. These settlers had over the large swamps and lakes turned into a fertile plain. The monograph has several parts, the first part of the presentation the authors of all the historical events of Banat and advancing the settlement in an advanced city, the second part is a translation of two monographs one with the German and the other with the Hungarian language. The third part consists of the chronology of events as well as biographies of famous personalities and the surroundings. The fourth part is dedicated to the vision of all the opportunities in life contemporaries expressed in the articles of local newspapers, starting from 1851 years and publishing a durable "Gross Betschereker Wochenblatt-a". Due to the volume of work we need financial support to print this capital work.